The Madeira High School Class of 1965 Dedicated our Class Yearbook to Mrs. Helen Swafford. We thought some of you would like to know more about this wonderful teacher. As the Senior Class of 1965 approaches the end of its high school years, we pause to show special appreciation to one who has contributed her time and energy in every way possible in each phase of those years. From the time we first entered Madeira High School, you have served as a valuable guide to all of us. As our educations progressed we came to you for advice and encouragement and you have never turned us away. Your ideals of fair play, hard work, concentrated study, and efficient organization have been passed on to us through this devotion. 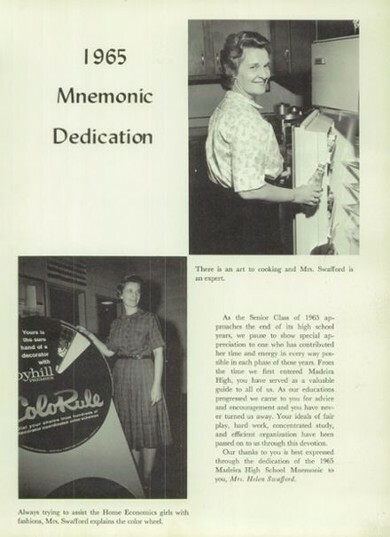 Our thanks to you is best expressed through the dedication of the 1965 Madeira High School Mnemonic to you, Mrs. Helen Swafford. Helen Swafford passed away in Bakersfield, CA where she lived with her husband Oscar (teacher at Indian Hill). They moved to CA in the early 80's and lived next to their son Dr. Albert Swafford (Al) until her passing on July 21, 1996. She had been in good health with some problems with her back that caused her a lot of pain but she lived a full life playing with grandchildren, fishing lakes in surrounding counties and touring trips in their motor home. She enjoyed Al's 3 children living just next door; watching them swim and play through the years. 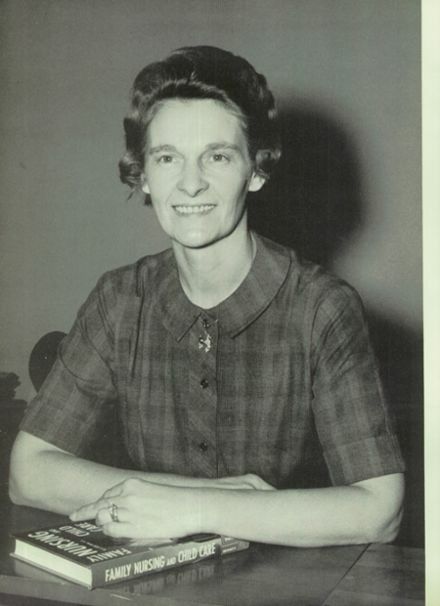 Mrs. Swafford was an avid church goer and was on many committees at the Calvary Baptist Church. Helen Swafford was the fifth child to Albert and Retha Lewallen from Harlan, Kentucky and the second child to live to adulthood. The first child to live was Lillian Coe, older sister by 13 months. In all, there were 7 children with only 4 becoming adults. All 4 siblings called Madeira home from the mid-50's until her younger sister, Norma passed away in 2010. Sisters--Lillian Coe (Also a teacher at Madeira High School) currently lives in Lexington with her daughter, Jan Coe Davis (MHS Class of 1964) and Ethel Green (taught 1st grade in Madeira) who passed away in 2005 and Brother--Edgre Lewallen (Bud) (deceased) merchant in the old downtown Madeira. Mrs. Swafford loved the years she spent at Madeira High. There was no prouder Mustang except for 4 nights--one night a year-- when Madeira and Indian Hill played their football games. Her son, Al Swafford, played for Indian Hill. She said she just would not watch those games.